Harry and I with Dennis Brophy as moderator will work together to give an intro to the session, talk about what to expect and show people how to participate. From there, we’ll work through a list of topics that relate to agile hardware development and verification. Harry and/or I will give our opinion(s) on each topic while people in the audience can chime in with follow-up questions or opinions of their own on the same topic. We’re working on the prep now, which is where I’m looking for you to jump in. 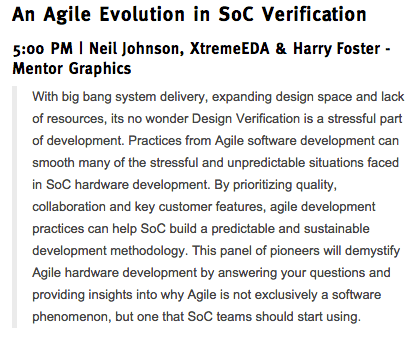 I see this verification academy panel as a chance to reach out to people that are either skeptical of agile development or afraid of it. I need your help with a list of questions or claims about the applicability of agile in hardware development to use as discussion fodder. And hopefully I don’t regret this, but while you’re brainstorming, try to think like a hardline skeptic or someone scared they have something to lose by using agile development. Be tough; nothing easy. I want people in the audience to feel comfortable critiquing agile hardware without holding back and I think opening with tough questions will do that. Not that I think I’m good enough to answer them all and beat down any arguments against agile hardware, but that’s not the point anyway. I’m going in with the idea that in giving people a chance to talk through their concerns, we can smooth over at least some of the misconceptions and do just a little to ease people’s fears. Who knows exactly what’ll happen, but that’s the idea. Hopefully it isn’t me that gets the beatdown! So if you’re up to doing a little brainstorming and helping us out with some material (it’d really help us out), please either add a few topics in the comments or send them to me in an email at neil.johnson@agilesoc.com. I’ll take whatever I can get, make slides out of them and use them to guide this session at DAC. Thanks for your help. Like I said, you can either add discussion topics in the comments or send them to me at neil.johnson@agilesoc.com. And if you’re attending DAC, be sure to come hang out at the Verification Academy booth at 5pm on Monday June 8th!